Which one of the following movies do you think should win the Academy Award for Best Picture? The statistic presents information on consumers' opinion which movie thought think should win the Academy Awards for the category Best Picture in 2018. 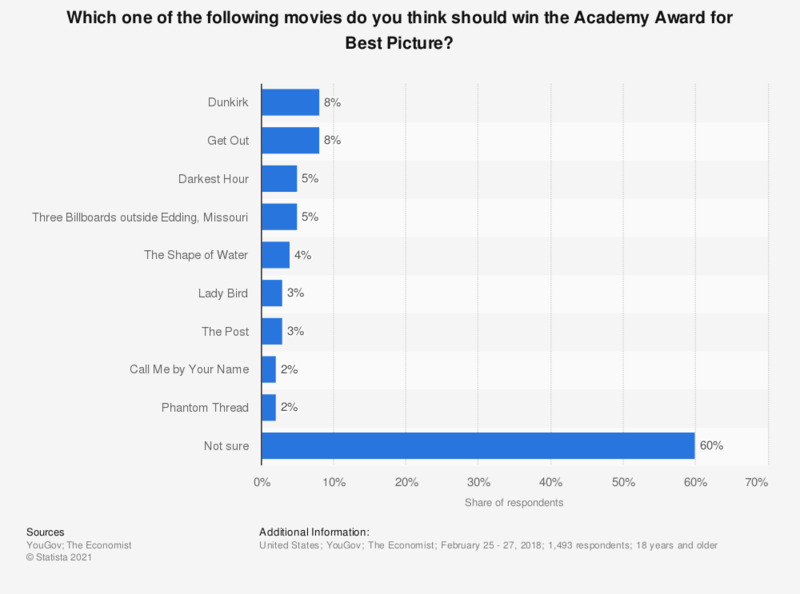 During a survey, eight percent of respondents stated they thought 'Dunkirk' should win the Academy Award for Best Picture. Which one of the following actresses do you think should win the Academy Award for Best Supporting Actress? Which one of the following actors do you think should win the Academy Award for Best Supporting Actor? Which one of the following actresses do you think should win the Academy Award for Best Actress? Which one of the following actors do you think should win the Academy Award for Best Actor? Which one of the following directors do you think should win the Academy Award for Best Director? Which one of the movies do you think should have won the Academy Award for Best Picture in 1939?